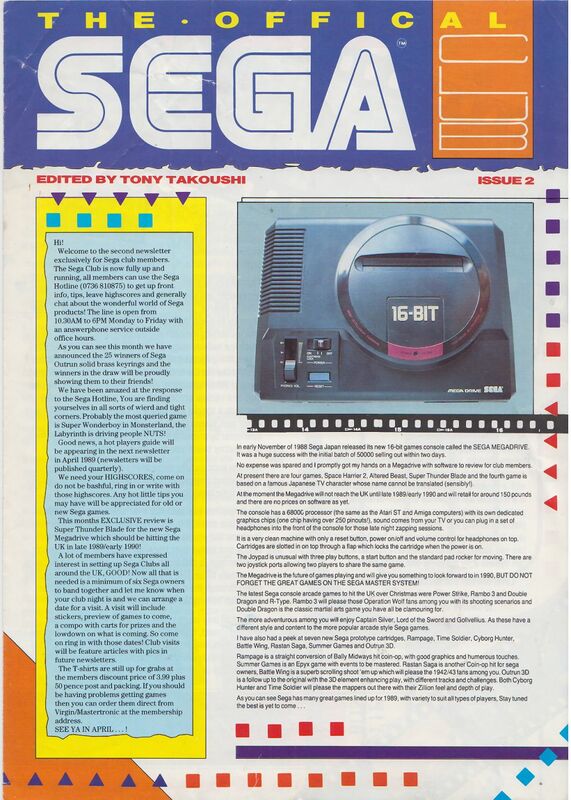 Sega Master System Official Club Magazine - Issue 02 - United Kingdom Magazine - Scans - SMS Power! Welcome to the second newsletter exclusively for Sega club members. The Sega Club is now fully up and running, all members can use the Sega Hotline (0736 810875) to get up front info, tips, leave high scores and generally chat about the wonderful world of Sega products! The line is open from 10.30AM to 6PM Monday to Friday with an answerphone service outside office hours. As you can see this month we have announced the 25 winners of Sega Outrun solid brass keyrings and the winners in the draw will be proudly showing them to their friends! We have been amazed at the response to the Sega Hotline, You are finding yourselves in all sorts of wierd and tight corners. Probably the most queried game is Super Wonderboy in Monsterland, the Labyrinth is driving people NUTS! Good news, a hot players guide will be appearing in the next newsletter in April 1989 (newsletters will be published quarterly). We need your HIGHSCORES, come on do not be bashful, ring in or write with those highscores. Any hot little tips you may have will be appreciated for old or new Sega games. This months EXCLUSIVE review is Super Thunder Blade for the new Sega Megadrive which should be hitting the UK in late 1989/early 1990! A lot of members have expressed interest in setting up Sega Clubs all around the UK, GOOD! Now all that is needed is a minimum of six Sega owners to band together and let me know- when your club night is and we can arrange a date for a visit. A visit will include stickers, preview of games to come, a compo with carts for prizes and the lowdown on what is coming. So come on ring in with those dates! Club visits will be feature articles with pics in future newsletters. The T-shirts are still up for grabs at the members discount price of 3.99 plus 50 pence post and packing. If you should be having problems getting games then you can order them direct from Virgin/Mastertronic at the membership address. In early November of 1988 Sega Japan released its new 16-bit games console called the SEGA MEGADRIVE. It was a huge success with the initial batch of 50000 selling out within two days. No expense was spared and I promptly got my hands on a Megadrive with software to review for club members. At present there are four games, Space Harrier 2, Altered Beast, Super Thunder Blade and the fourth game is based on a famous Japanese TV character whose name cannot be translated (sensibly!). At the moment the Megadrive will not reach the UK until late 1989/early 1990 and will retail for around 150 pounds and there are no prices on software as yet. The console has a 68000 processor (the same as the Atari ST and Amiga computers) with its own dedicated graphics chips (one chip having over 250 pinouts! ), sound comes from your TV or you can plug in a set of headphones into the front of the console for those late night zapping sessions. It is a very clean machine with only a reset button, power on/off and volume control for headphones on top. Cartridges are slotted in on top through a flap which locks the cartridge when the power is on. The Joypad is unusual with three play buttons, a start button and the standard pad rocker for moving. There are two joystick ports allowing two players to share the same game. The Megadrive is the future of games playing and will give you something to look forward to in 1990. BUT DO NOT FORGET THE GREAT GAMES ON THE SEGA MASTER SYSTEM! The latest Sega console arcade games to hit the UK over Christmas were Power Strike, Rambo 3 and Double Dragon and R-Type. Rambo 3 will please those Operation Wolf fans among you with its shooting scenarios and Double Dragon is the classic martial arts game you have all be clamouring for. The more adventurous among you will enjoy Captain Silver, Lord of the Sword and Gollvellius. As these have a different style and content to the more popular arcade style Sega games. Battle Wing, Rastan Saga, Summer Games and Outrun 3D. Rampage is a straight conversion of Bally Midways hit coin-op, with good graphics and humerous touches. Summer Games is an Epyx game with events to be mastered. Rastan Saga is another Coin-op hit for sega owners. Battle Wing is a superb scrolling shoot ‘em up which will please the 1942/43 fans among you. Outrun 3D is a follow up to the original with the 3D element enhancing play, with different tracks and challenges. Both Cyborg Hunter and Time Soldier will please the mappers out there with their Zillion feel and depth of play. This issues offering is Super Thunder Blade for the Sega Megadrive, this game is an action packed heart pounding zapper in the best Sega tradition. Super Thunder Blade is not a direct clone of the arcade hit, it has taken the essence of the original and added a few extra presentation touches. On switching on the console you are greeted by the familiar digitised piccy of a helicopter with the logo daubed in blue and red. You are then treated to demos of levels one and two, returning to the high-score table. As with all Megadrive carts you can set the play options before starting, difficulty level (hard/medium/easy), control (normal or reverse), lives (3,5,7) and sound test with a choice of 23 spot effects and tunes to listen to. There is a nice startup sequence on each of the four levels to the game (a ramp taking you up to a launch platform/hydraulic platform easing you down to the launch pad for level two/ level three has you being released by clamps and level four has you sliding in from the left on a special launch pad), you can bypass it by pressing one of the buttons. Level one has you battling in a city amongst skyscrapers, tanks and gunships fire missiles at you and you have to swerve and avoid them while shooting back. This happens at an eyeball rolling pace with tower blocks creeping in and filling up the full height and most of the width of the screen. If you hit a building you burst into a ball of flames and slowly plummet down to the ground with the building sliding down in front of you (awesome stuff!). The road curls from left to right and you have to swerve violently to avoid the ever increasing missiles and building combinations. As you reach the halfway stage an enormous tank rolls out in front of you firing masses of missiles, you have to circle in the best Space Harrier tradition around the screen zapping its turrets. When you get to the end of the city scene the play flips to a vertical scroller. Here you have to destroy the bases on a special gun platform below you, the platform is about four screens long and you can slow down your helicopter by pressing the B button allowing you to go back and destroy bases you may have overshot. If this is successfully negotiated you are given an end of stage bonus dependent on the number of enemy destroyed an the time taken to complete. Stage two has you zooming over a forest avoiding trees, tanks, jets and cliff faces. The action is just as frantic as level one but you have to use the slow down button to dodge and weave over trees, missiles and down through the openings in cliff faces. The cliffs appear in the distance and slowly fill up THE WHOLE SCREEN and you have to fly down through the openings while avoiding the missiles launched from tanks on the other side!! At the half way stage you encounter a jet with a rather deadly exhaust, it spews out fire from both its rear engines and from its main exhaust. The action hots up even more after this with faster enemy combos and one evil mother of an endstage scrolling gun platform. Level three has you all at sea, literally, with enemy destroyers to avoid with the customary helicopters and jets. The detail on the ships is superb with a great backing tune and oomphy sound effects. The midway nasty is a submarine, this surfaces from below gorgeous blue rippling waves and promptly starts letting you have it. Again the key is to keep moving and firing. The final stage has you battling through a metallic city where the emphasis is on cat like reflexes and steady nerves. You have to zap helicopters and tanks while avoiding the huge metallic bars that block your way (along the lines of the Star Wars arcade game). The action is furious and you need a steady hand to find the gap between the bars approaching all too rapidly. The midway hazards are two characters straight out of a Japanese sci-fi cartoon, they are tall armour clad aliens which fire very quickly at you while they dodge to avoid your return fire. Super Thunder Blade is by far the best game for the megadrive, the other two are excellent games in their own right but for me this game has a beautiful feel, you really do get that gut wrenching feeling as you dodge between the buildings and the joystick has JUST the right amount of inertia. The feeling of exhiliaration has only been matched on playing full size arcade machines. The tunes and spot effects are the best on any home '''Sega game and the graphics amongst the most detailed and colourful. THUNDERBLADE - This is a hot one! On level four you can avoid the bars by staying at the bottom of the screen, this should save you a fair bit of joystick waggling! CHOPLIFTER - On round 4 rescue all 16 hostages and ET flys across the moon. BLACK BELT - After defeating Wang and the princess is rescued, but before the screen turns red, wiggle the joystick and press buttons 1 and 2 on the control pad, you can then enter the 7th round. 6. SHINOBI - To use Ninja magic hold down button 2 and then press button 1 once. 7. AFTERBURNER - When in the title screen (before entering the demonstration screen) press the pause button 100 times and then start the game. You can continue to stage 17 without any problems. You have been joining the Sega Club in droves! The draw was made in December and the 25 winners of the solid brass keyrings with the Outrun logo are listed below. Here is your chance to get your hands on the tasty Sega T-Shirt. This is an exclusive Sega club offer and the T-Shirts will be available at the special club price of £3.99 each plus postage and packing of 50p. Please quote your membership number and details along with your chest size (medium, large or extra large) and send payment with the sega club application form below. Do not forget if you want to receive the newsletter, use the Hotline and be eligible for competitions and club offers YOU MUST REGISTER. YES I WANT TO JOIN THE SEGA CLUB. I HAVE ENCLOSED A CHEQUE/PO FOR 5 POUNDS PAYABLE TO SEGA CLUB. It is highscore time and the nominated game for the next newsletter is Double Dragon. Two of the more popular scoring games (and with harder scores to beat!) are FANTASY ZONE 2 and OUTRUN with the scores staying the same, that is unless you can do better..
Ring in on the Hotline or drop us a line with your new highscores, CHEATS BEWARE WE MAY ASK FOR PROOF OF YOUR SCORE!! WHERE ARE THOSE SCORES FOR SPACE HARRIER 3D / SUPER WONDERBOY/ RAMBO 3? Quite a few members have asked whether US Sega cartridges will work in the UK, in the main the answer is yes, they are the same size and are compatible BUT there are the odd few that due to coding differences will not run over here. The third party games are arriving for the sega with R Type from IREM and Double Dragon from Tecnos and this looks to be continuing so 1989 should see some more arcade favourites winging their way onto the Sega. On the hardware front there is still no news on the FM Sound unit BUT I have managed to use the inbuilt one on the recently released Japanese 16-bit Sega console. Put quite simply it is superb pin sharp sonics and music to bounce along to while playing. The Sega Megadrive will not be released in the UK until late in 1989 and probably will not be here in any kind of quantity until 1990.